Quick Post: This pasta was amazing! I have tried and posted several shrimp pastas here, and this one is sure to be a repeat offender in this house. This was my first time using mascarpone cheese – it’s like butta! It created a smooth and creamy sauce that perfectly complimented the rest of the flavors in this dish. I really like the oven dried tomatoes, because all that richness would be overpowering if not for the presence of the slightly acidic, sweetness of them. They’re worth making, especially if you want to avoid preservatives of most store-bought sun dried tomatoes. The kids were leery of them, but I explained that they’re like tomato-raisins 😉 Thanks for reading, enjoy! To make the oven dried tomatoes, preheat the oven to 225˚ F. Place the tomatoes in a small baking dish in a single layer, cut side facing up. Drizzle lightly with olive oil and season with a pinch of sugar, salt and pepper. Bake for about 3 hours, or until the tomatoes are mostly shriveled up. Refrigerate until ready to use. Bring a large pot of salted water to boil. Once boiling, cook the pasta according to the package directions. Drain well. While the pasta is cooking, melt 1 tablespoon of the butter in a large saucepan over medium-high heat. Add the shrimp to the pan and cook in a single layer, flipping once during cooking, just until opaque, about 2-3 minutes. Remove to a plate, tent loosely with foil and set aside. Melt the remaining tablespoon of butter in the pan. Sauté the onion until slightly softened, about 4-5 minutes. Add the garlic and red pepper flakes to the pan and sauté just until fragrant, about 30 seconds. Add the wine or broth and scrape any browned bits from the bottom of the pan. Reduce the heat to medium-low. 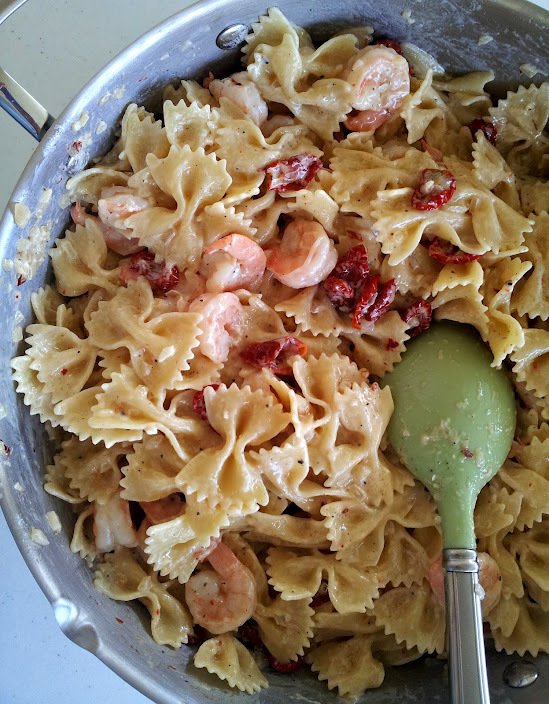 Return the shrimp to the pan and add in the drained pasta along with the oven-dried tomatoes. Add the mascarpone to the pan and stir until completely melted. Stir in the basil and Parmesan, and season with salt and pepper to taste. Serve immediately with additional Parmesan as desired. What a wonderful looking pasta dish – delightful. Oven dried tomatoes are among my favourite ingredients. 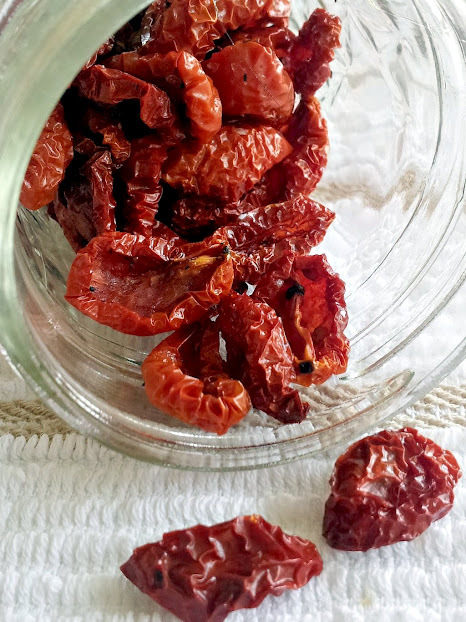 Oven dried roasted tomatoes are a perfect addition to add sweetness and depth of flavor to many dishes. This one looks really yummy.